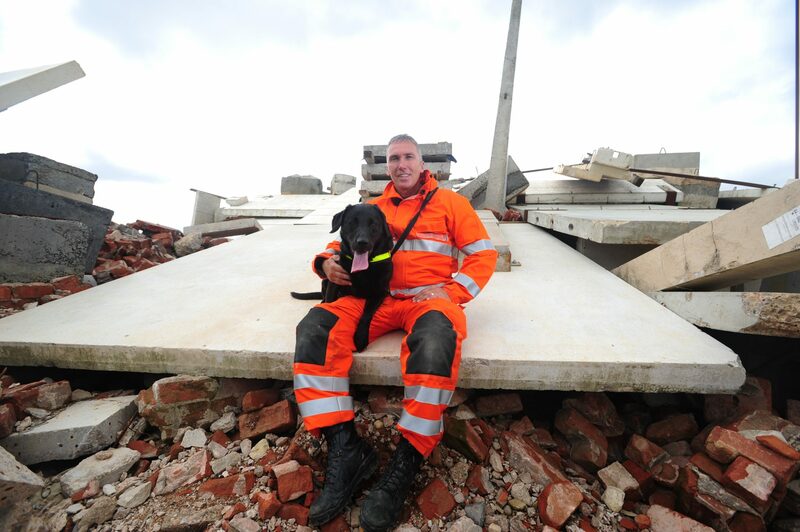 A heroic Labrador has passed away after an incredible life working as a search and rescue dog in earthquake zones across the world. Black Lab Holly died on December 12 aged 15, after a glittering career which saw her meet celebrities, royalty and appear in the 2012 Olympic torch relay. She also worked in dangerous conditions in Pakistan and Haiti following earthquakes in the countries in 2005 and 2010. Her bravery in the Kashmir area of Pakistan saw her given a bravery award for her actions and in 2011 after her service ended she was given the Golden Oldie Award at the Dogs Trust Awards. Holly became a search and rescue dog for Lincolnshire Fire and Rescue when she was just 15 months old. One of her first deployments was to the Stockline Plastics factory explosion in Glasgow in May 2004. Neil Woodmansey, 53, Holly’s owner and handler for her ten years of service, said: “I think she was the youngest dog in the country to qualify as a search and rescue dog. Holly’s nose for sniffing out survivors meant she was selected to go to Pakistan in 2005 following the Kashmir earthquake and then onto Haiti in January 2011. But Neil said the decision to take Holly all over the globe came at a price as she was quarantined for six months at the end of both trips. He said: “She was naturally the best dog in her field so she was chosen for both the UK search and rescue team and the international search and rescue team. “In Haiti she worked for around 11 days straight and then had to face six months in quarantine after she got back. Holly also met a slew of celebrities throughout her life, including Carol Vorderman, Ben Fogle, Lorraine Kelly, Myleene Klass and Princess Anne. Neil, who is dad to Emma, 19, and Adam, 25, and step-dad to Tom, 20, and Jamie, 25, said when he was awarded his MBE for his life-saving work in 2011 he even joked to the Queen that it should be Holly getting the award rather than him. He said: “When I met the Queen for the MBE she asked me how Holly was and I said to her it should be Holly receiving the medal instead of me. Holly was so revered in her hometown of Sleaford, Lincs., that she was named Sleafordian of the Year. Neil said: “Everywhere we went people knew of Holly in the town. I think people only know me as Holly’s handler. “Holly has done more than the average dog and she was a genuinely lovely dog. “All she asked for at the end of training was a squeaky ball to play with. “When she was operational she used to come into work with me and sleep under the desk. “She also liked to wander around the building and spend time with other people. “The firefighters used to give her little treats when they shouldn’t have. “I think over the years I spent more time with Holly than my own family. Neil said Holly’s death has been hard for the family, especially for Maisy, seven, their other black Labrador who was Holly’s protégé. He said: “Maisy is a bit lost at the moment without Holly. “Holly helped to train her and when we went on training days Holly would come along even after she retired up until a few months ago when she was just too old.